Pattern Description: Misses pants in slim or wide leg, in two different lengths. Pattern Sizing: Based on my hip measurements, I made a 14, but should have gone with a 12 overall with a 14 in the hips. The waist came out kind of big. Did it look like the photo/drawing on the pattern envelope once you were done sewing? Yes, I think so. Were the instructions easy to follow? Yes, they were pretty easy to follow. This is my first time ever making pants with a fly front, and I thought the instructions on how to construct the fly front were good. What did you particularly like or dislike about the pattern? I was drawn to this pattern because I like wide leg pants. I was also drawn to the button and flap detail on view A’s & B’s pockets. Fabric used: Beige/brown cotton blend tweed from Fashion Fabrics Club. Pattern Alterations or any design changes you made: I took the pants in, in the crotch area, so they wouldn’t sag. Would you sew it again? Would you recommend it to others? 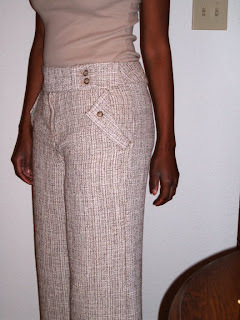 I will be sewing another pair of these pants in brown wool, with the cuff and without the pocket flap. Yes, I would recommend this pattern. However, if you have a small waist, I would suggest trimming the pattern to a size smaller than the package says you need. Conclusion Considering this is my first time making “real” pants, I think they came out pretty good. These are really cute pants! Great job!! I agree. I think you did a really good job on them! And I love the pocket detailing too! Nice!! I love the pocket detail. This is a great outfit with your jacket.